Is it time for a service panel upgrade at your home or business? There are many reason that a service panel requires to be upgraded. Property has screw-in fuse type panel. Insufficient space in the panel. Inadequate power supply capacity (less than 200 Amp). Does your service panel look like the picture above? 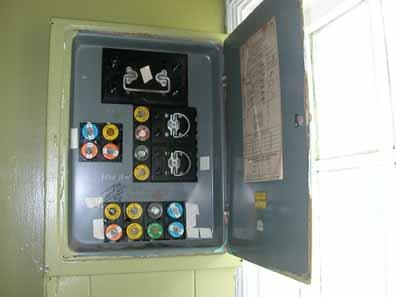 The picture shows an old style screw in fuse type panel, these are no longer sold and should be replaced with an up to date circuit breaker style panel. A fuse style panel is very inconvenient to use as you may not have the fuse on hand that you need to replace the blown one. This can be dangerous as people are often tempted to insert the incorrect size into the slot, THIS IS A VERY DANGEROUS PRACTICE and should never be done. There is one major problem with this type of fuse panel, it not as sensitive as a circuit breaker at detecting a fault and may not disconnect the power in time to save lives. A modern circuit breaker will disconnect the power in an average time of around 40 to 100 m/s, there also circuit breakers that have specialist applications for different areas of the home. An Arc Fault Circuit Interrupter (AFCI) is a circuit breaker designed to prevent fires by detecting an unintended electrical arc and disconnecting the power before the arc starts a fire. An AFCI must distinguish between a harmless arc that occurs incidental to normal operation of switches, plugs and brushed motors and an undesirable arc that can occur, for example, in a lamp cord that has a broken conductor in the cord. Arc faults in a home are one of the leading causes for electrical wiring fires. Each year in the United States, over 40,000 fires are attributed to home electrical wiring. These fires result in over 350 deaths and over 1,400 injuries each year. Conventional circuit breakers only respond to overloads and short circuits; so they do not protect against arcing conditions that produce erratic, and often reduced current. An AFCI is selective so that normal arcs do not cause it to trip. The AFCI circuitry continuously monitors the current and discriminates between normal and unwanted arcing conditions. Once an unwanted arcing condition is detected, the AFCI opens its internal contacts, thus de-energizing the circuit and reducing the potential for a fire to occur. An AFCI should not trip during normal arcing conditions, which can occur when a switch is opened or a plug is pulled from a receptacle, or a device with a brush-type motor is in operation. In the United States and Canada, a residual-current device is most commonly known as a Ground Fault Circuit Interrupter (GFCI),Ground Fault Interrupter (GFI) or an Appliance Leakage Current Interrupter (ALCI). Ground Fault Condition is defined as: An unintentional, electrically conducting connection between an ungrounded conductor of an electrical circuit and the normally non-current-carrying conductors, metallic enclosures, metallic raceways, metallic equipment or ground. Sometimes it becomes necessary to upgrade the power line that comes into the house. Older houses only have a 100 Amp service and modern life requires a 200 Amp service in most average size home. The operation also involves the power company which in Virginia is Dominion Power. This whole procedure can be organized by British American Electric of Isle of Wight for their customers. This may be needed if the customer is adding more load such as a hot tub, new double oven, workshop or maybe even an addition. Often if you are improving the home it requires more space in the panel to accommodate the improvements. British American Electric can increase the size of the panel up to 42 circuits. Lee, Douglas A.; Trotta, Andrew M.; King, William H. (Aug 2000). “New Technology for Preventing Residential Electrical Fires: Arc-Fault Circuit Interrupters (AFCIs)”. Fire Technology(Kluwer Academic Publishers) 36 (3): 145–162. doi:10.1023/A:1015410726786. ISSN 0015-2684. Retrieved Feb 26, 2013. Ault, Singh, and Smith, “1996 Residential Fire Loss Estimates”, October 1998, U.S. Consumer Product Safety Commission, Directorate for Epidemiology and Health Sciences. Electrical Inspection does Your Home Need one? Why Do I Need a Ceiling Fan?